Islam is more than calling yourself a Muslim, it’s about LIVING as a practicing Muslim. 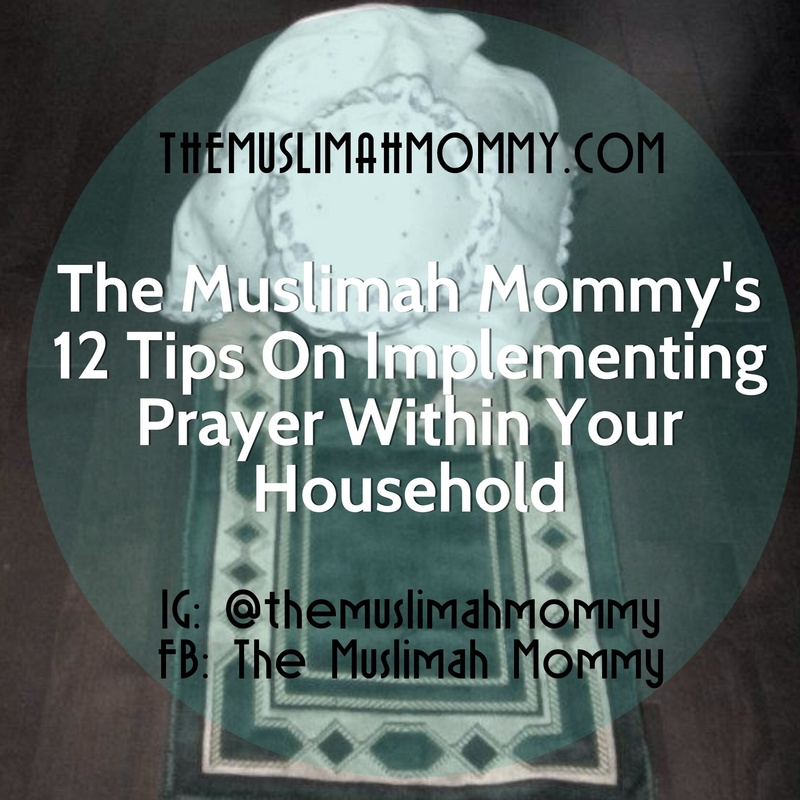 A huge part of being a Muslim is performing salah (prayer); and often times, maintaining an environment of prayer within your home can be challenging. With that said, below are some tips on how you can help implement prayer within your family. Educate: Educate your family on the importance of prayer – It should be known that prayer is one of the five pillars of Islam. Prayer Time Reminders: If you live in a country that does not have the Adhan (the call to prayer) then you can use an alternate method to remind your family of the time of prayer. Such an alternative method is an electronic clock that you can program to have the Adhan recitation play aloud at certain times. Another option is to have a reminder on a cell phone or iPad that will go off at the time you set it to. Another tip is having a salah calendar on each floor of your home, thus making the prayer times easily accessible. Wudhu Often: One of the reasons people may be hesitant to pray is because of laziness. Some individuals might miss prayer simply because they don’t want to perform wudhu; however if you already are in a state of wudhu you may be more motivated towards performing your prayers. One way to be in a state of wudhu more often is to wudhu each time after you go to the bathroom. If you have to wash your hands anyways, then you might as well perform wudhu; this way when the prayer time comes around you can pray right away. Create A Schedule: Plan a schedule that works around the prayer times. If you leave the house make sure you have performed the latest prayer, and plan to come home before the next prayer time ends. Alter Your View Of Prayer: Instead viewing prayer as a chore, view it as a time of peace where you thank Allah for everything you have, and to ask for forgiveness. Instead of rushing through prayer, take your time and do Dhikr and make Dua, this way the experience of prayer will be a relaxing one. Praying At Work: Ask your employer if you can use a room for praying, this way you are maintaining the habit of prayer. Consistency: Once a month, women are unable to pray due to menstruation, however this should not stop prayer altogether within the household. If you are a mother and are unable to pray, you should still encourage your children to perform prayer; thus keeping the consistency of prayer within the home. A Special Prayer Mat: Have your children go with you to select their very own prayer mat, or have them help you to choose one from an online store. Furthermore, buy them a special hijab or prayer hat that they can wear for prayer. These small steps will excite children for prayer, and make prayer time extra special for them In Shaa Allah! Let Your Children Observe You In Prayer: Kids want to be just like their parents! Try your best to pray with your young children in the same room as you, this includes babies. Place your baby or toddler beside you, so they can watch you pray; as time passes you will you notice your toddlers mirroring you in worshiping Allah. Take Your Children To The Mosque: When your children see others in prayer, they will get excited and realize that it is not just your family that performs prayer, but a community of people from different backgrounds and cultures. Prayer Time Is Family Time: Prayer time should be family time within your household. Families should pray together in one room to increase the family bond. After prayer, sit together and recite Islamic stories to your children. Not only will this increase the bond between each family member, but this will also increase the love for Islam. Don’t Give Up: We are all human, and we may notice a drop in our Imaan from time to time. With that said, don’t let a drop in Imaan prevent you from increasing your Imaan. Try your best to recollect yourself: recite the Quran, listen to some inspirational Islamic lectures, and get back into the habit of praying. It is never to late to better yourself and to increase your Imaan; make sincere Dua and Allah will make prayer easier for you! سبحان الله your post is very…very informative. الصلاة is the second filar is very important to do. We need الله in our lives. الصلاة is one of ways to connect to الله . That’s totally right, we have to teach n educate our kids to establish prayers step by step. May الله make easy our duty to teach الصلاة to our kids. Practice الصلاة with them is the best way. I strongly agree with you, my dear sister. Masha’Allah well said sister! You bring up many excellent points 🙂 And yes, we are our children’s first teacher and role model, so we have to be aware of what we do and do not teach them! جزاك الله خيرا , a little of my mind Sister. You’re really a GREAT MOM! n best example for your kids, n for another moms, masha’Allah. masha ALLAH! what a great piece of advice. Masha’Allah! Perfectly stated! May Allah reward you and bless you and your family! I can totally relate with toddlers imitating our salah. That’s exactly what my baby sister does too! 😉 It’s adorable!